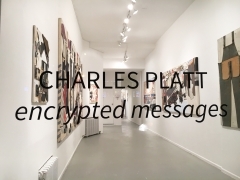 Freight+Volume is pleased to announce Charles Platt's new solo exhibition, encrypted messages. 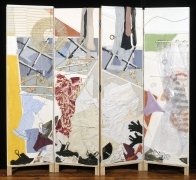 The exhibition showcases Platt's extensive body of collage work, a practice that he maintains parallel to his career as an architect. 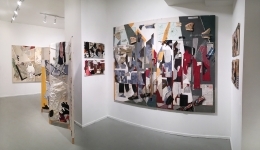 Integrating found objects, particularly clothing, which are transformed and restructured, his collages are both formally dynamic and suggestive of an elusive, interior narrative. 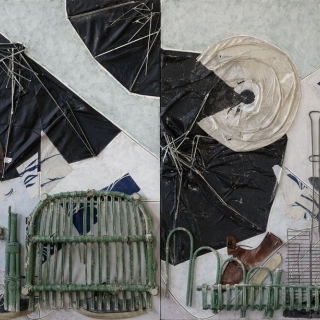 As the artist tells it, he started making his collages in 1959, when he abandoned an oil canvas in the fall and returned in the spring to find a pair of workman’s overalls hanging on it. 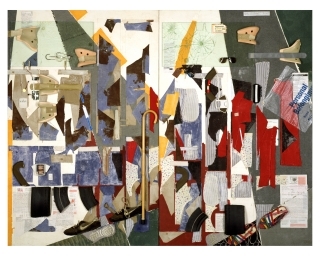 This became his first serious collage work, The Hired Man. The found materials in Platt’s work thus have held a dual function of providing a formal groundwork as well as content. Everyday objects, no matter how banal, carry a wide array of associations, and possess the ability to evoke powerful responses in the viewer. 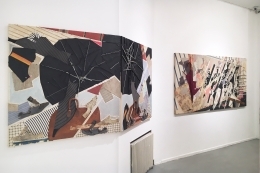 Platt's work exploits both these facets; his dissection of common objects yields a host of novel forms, which he organizes into tautly constructed arrangements. His juxtaposition of clothing and personal effects with abstract backgrounds conjures an almost uncanny sense of disconnection between fact and fiction. 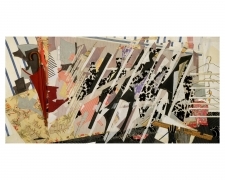 Platt's handling of the found materials that form his collages reflects his architectural training. Clothing and shoes, persistent motifs in his oeuvre, are cut open to reveal their surprisingly complex internal structures, and these inner frameworks in turn define the compositions as a whole. 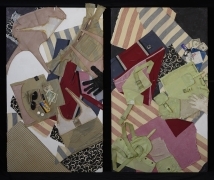 These collages have the ability to function as portraits, as with Tom, where an arrangement of flayed open shirts evokes the ghostly presence of the implied owner. Platt also applies this constructive sensibility to a remarkable variety of other objects, from wallets and travel bags to wire coat hangers and measuring tapes. His series of deconstructed wallets and purses paint a portrait of the instruments of travel and the lives they contain. 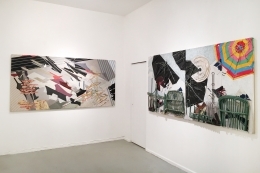 Other of his works, such as Double Diptych, use preexisting materials as a formal building blocks in abstract assemblages. Charles Platt graduated from Harvard College and the Graduate School of Design at Harvard, and studied painting at the Art Students League of New York and the Boston Museum School. Platt has been a practicing architect since 1960, and is currently a partner at Platt Byard Dovell White Architects, LLP. His firm has received many design awards and his work has been published around the world. 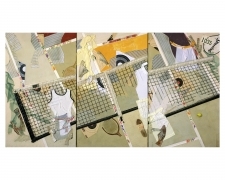 Platt has had two solo exhibitions of his collages. Please join us for the opening reception with the artist on Thursday, January 19th from 7 to 9pm. Refreshments will be served. For further information, please contact nick@freightandvolume.com, or call 212.691.7700.